The Other Sock: This shouldn't be so hard! It's something I have been saying lately. 'This Shouldn't Be So Hard', 'This is Ridiculous', 'I don't Understand Why This Is Taking So Long', 'Why Aren't These People Calling me Back? ', 'I'm Too Tired to Do This', 'I Don't Like Planning', 'This Is Stupid', 'I Hate Everything', 'Shut Up and Give me That Other Spool of Ribbon Before I Strangle You With It', etc. And the list goes on. In light of this, I have found new and innovative ways to cope with the planning process. Now, I have been up all day and all night, so I am very tired. I was going to write this blog earlier but then I went and watched 'Oklahoma!' instead. So this is going to be short. 1. Writing reminders in Sharpie on my palm. i.e. "Drink water!" 2. Writing reminders on the side of my thumb. i.e. "Do laundry." 3. 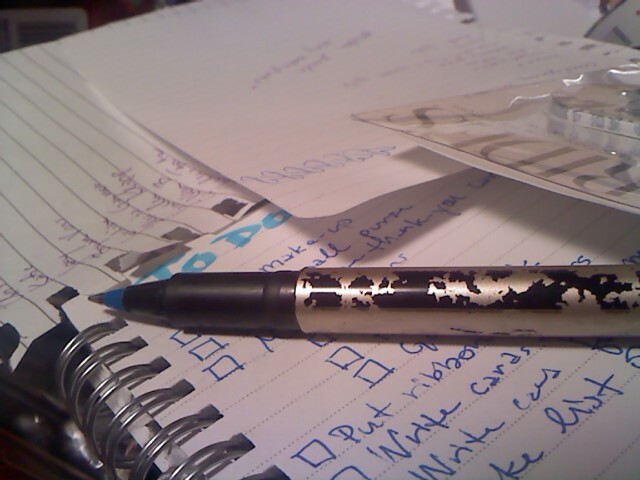 Writing lists and consequently forgetting about them, but doing the tasks on them anyway. 4. 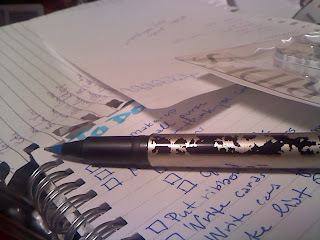 Writing lists of other lists I need to write. Yes. I do this. 5. Starting one important project in the living room and then feeling anxious and starting something upstairs and then feeling antisocial and starting one in the kitchen and then the dining room etc. etc. until my father calls all of it "junk" and my mother makes me a "downstairs basket" to put my "junk" in. Saywhat? 6. Going to get a marriage license and getting laughed at by a cop when we asked how to get to the licensing office because he thought we meant the DOL. 7. Buying lots and lots of ribbon and looking very serious while doing so in the craft section at Wal-mart. The more serious I look, the less those creepy men who go to Wal-Mart late at night in Bonney Lake will stare at me. Yes, I know I look funny. This is called a dress. Sorry, forgot my overalls in the trailer. 8. Crying. A lot. At everything. Happy, sad... whatever. 9. Still getting more sleep now than I ever do at school. 10. Having full rights to pester my friends endlessly and then give them really cool presents for it later. And now it's past my bedtime. That's right, I'm going to sleep.